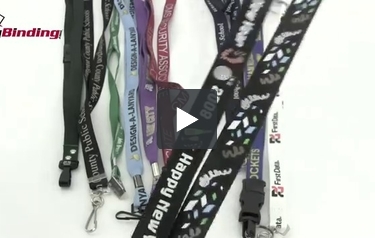 You might think that custom lanyards are too expensive for your organization but they are not. They look amazing and are a great way to keep your logo, brand or message in front of your employees, customers and community. Available in wide variety of options you can choose to have your lanyard silk screened, dye sub printed or have your logo woven directly into the lanyard itself. Your lanyard says a lot about your organization so why not allow your lanyard to represent your brand or event. Design yours today. Transcript: Welcome to MyBinding video. Do you need individualized lanyards for your project or event? We can help. We've got some ideas for you. Everyone is familiar with the black weave lanyard that clips onto your name tag. But, how about if you showed off your company a lot more? For instance, with dye sublimated lanyards, you can get a great image printed directly on your lanyard in any size, color, and on two sides. Many of these lanyards come away with safety breakaway tabs. With enough tension, they snap right off and can be refastened. Smart phone QR codes can be printed right on your lanyard. Welcome to MyBinding video. Do you need individualized lanyards for your project or event? We can help. We've got some ideas for you. Everyone is familiar with the black weave lanyard that clips onto your name tag. But, how about if you showed off your company a lot more? For instance, with dye sublimated lanyards, you can get a great image printed directly on your lanyard in any size, color, and on two sides. Many of these lanyards come away with safety breakaway tabs. With enough tension, they snap right off and can be refastened. Smart phone QR codes can be printed right on your lanyard. A second way of printing on lanyards is through silk screening. This can be a very inexpensive way of placing your logo or message on any size or color lanyard. It has the very same feel of an image that's printed on a t-shirt. The durability of this kind of print is not as long. However, most events are rather short and in some logos, the raised print looks nice. Again, breakaway tabs are safe and convenient. Opti-weave lanyards have a great texture to them. They're three-dimensional, very soft, and print works great on them. So far we've looked at silk screen and dye sublimated lanyards. Another way of printing is woven in. It's very long-lasting, very impressive, and your logo is woven directly into the fibers of the lanyard. You can't get quite as much color or image options but the durability is unbeatable. And finally, there are neon reflective lanyards. Not only just for safety, but also for eye-catching good looks. Regardless of your lanyard choice, you'll need an attachment. So check out our video on that, too. Let us help you make your next lanyard. For other demos and how tos, check out MyBinding.com.